Another example is BaseCamp, its pricing page shows four versions and tells us its Plus version is the most popular. Are these examples of versioning strategy? Why will these marketers draw our attention to one specific version if they are offering us choices that we are supposed to self-select? Versioning strategy is finding different customer segments and delivering different versions designed to appeal to each. For example there are customers who prefer a Acura and those that are happy with Civic. Strategy means making choices. Since a marketer has only limited resources they have to make a choice which segments they can serve and what versions should they deliver to maximize profit. Versioning tactics is second level of optimization, fine tuning if you will, after the strategy is chosen. For example different trim levels within Civic. This comes from sub-segmentation, recognizing there are still variances in customer types within a segment. Versioning tactics help extract additional profit from minor product variations. No significant resource commitments are needed. Self Selection is offering customers multiple versions at different price points so they self select. When marketers cannot clearly tell which customer is which, they simply present they version with the assumption customers pick the right one. Self selection works when customers know (to an extent) the value they get from each version and whether that matches the price they are willing to pay for it. A rational customer will pick the one that leaves them “consumer surplus“. Nudging is sending signals to the customer and applying many of consumer behavior methods to nudge them to choose the one the marketer wants. Nudging is important and effective when the customer does not know the value they get and whether or not the price they pay matches the value they get. When nudging is applied, usually there are three versions but these are not designed based on segmentation (i.e., not versioning strategy). These additional versions have just one role – help sell the real version. Despite multiple versions the marketer expects to sell only one which she highlights to draw customer’s attention to it. In case of information goods (and sometimes for experience goods like Wine) customers do not know the value and do not know what price to pay. Customers must first understand what they are buying before they can tell what value they get (DeLong). In such cases, when the customer is presented with just one version they do not know whether or not to buy it because there is no value information. Customers decide value and price to pay by comparing options so it helps to present them with more than one version. How many versions? In his 1997 paper on versioning, Hal Varian, tells us presenting three versions are better than two versions. The reason – extremeness aversion. Varian labels three versions as Goldilocks pricing. Unlike the tall, grande, venti (where customer can see value) it is not enough to depend on extremeness aversion to let the customers pick the “Pro” or the “Plus” version. Customers need to be nudged. The nudge could be either highlighting a version or using conformity principle to tell a prospective customer that most customers bought a certain version. Sometime all such influence methods are applied. What we are seeing with SurveyGizmo, BaseCamp and many other similar services telling us the “Most Popular” version is Nudging! Don’t their Enterprise Edition and Dedicated version count as versioning strategy since they are targeting high end large enterprises? It is correct that these are products that is designed for a different segment but I am not certain whether the enterprise segment makes its buying decisions through a website form like small businesses and individual customers do. I bet they have account managers to target the Enterprise segment. Does your business practice Strategic versioining or Nudging with Goldilocks Pricing? There is a children’s book called “Fox Tale Soup“. 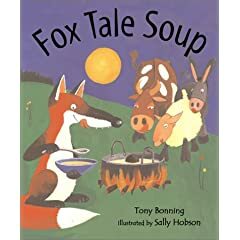 This is the old story of Stone Soup retold with Fox and farm animals. If you have not read the original I recommend reading this version. The fox slowly builds on his seemingly trivial request for water to get to all the ingredients for the soup. The farm animals one after the other ends up bringing salt, potato, rutabaga etc. There are multiple influence principles at play here. The fox started with an outrageous request, asking for food. Since he was a total stranger the animals so the animals were right in rejecting his request. Then he followed up with a trivial request, water, which is available in plenty. This is anchoring. Once the animal agreed and brought water, there eas no turning back. They ended up giving the rest of the ingredients because of the power of commitment and the inherent need in us to act consistent to our past actions (consistency principle). There was also consensus effect. Since other animals were helping the fox, any animal that had any misgivings about not helping the fox were nudged by the actions of others and were convinced to help. That is the power of persuasion. 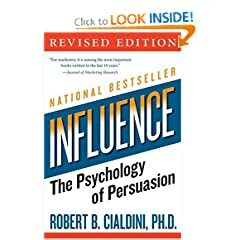 If you want the psychology behind this you should also read, Influence: The Psychology of Persuasion by Robert Cialdini. Other book I recommend is Nudge by Sunstein and Thaler. Their online Ad revenue may not be significant and advertisers do not think the readers respond to the Ads. Hence they want to compensate for lost revenue opportunities. More people read the print version, either within households or it is bought by local businesses for their customers. In addition readers may spend more time reading the newspaper. Together these two factors increase the Ad reach and hence the price Newport Daily News can charge their advertisers. Since the combo price is lower, those who prefer online version will buy this version and may simply throw away the print version. While the newspaper may claim higher “print impressions” with their advertisers, there is no net increase in reach for the advertisers. The pricing also goes against customer expectations and assumptions – customers believe online only version should cost lower than print version because of cost difference. To a marketer cost has nothing to do with pricing which is purely based on value, but customer perceptions set a low reference price for online only version. This low reference price prevents the marketer from capturing all the value. The Newport Daily News may now be employing behavioral economics to nudge customers to pick the print only or the print + online combo over the online only version, but sooner or later they are going to find resistance or backlash to their high priced online only version.